A new book by Rutt Bridges examines the impact of autonomous vehicle technology on mobility. 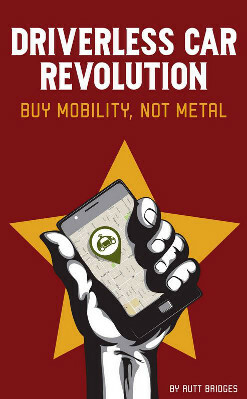 It is an excellent read, a thought-provoking book which paints a very detailed picture of the future of mobility. It is a wake-up call for the auto industry and a must-read for anyone involved with transportation policy. Imagine a future without congestion, car crashes, smog, or road rage. It’s coming sooner than you think. Summoned with an Uber-like smartphone app, driverless cars will revolutionize transportation. For less than bus fare you’ll enjoy the quiet, comfortable door-to-door service you’d get from a personal chauffeur. A chauffeur that is never distracted, never tired or testy, and always knows the fastest and safest route to get you where you’re going. No cash, no tipping, no crowds, no congestion – just hop in, enjoy the ride, hop out, and be on your way. These cars will be electric: quiet, clean, and so safe that deaths and disabilities will be rare. Instead of dealing with road rage and the frustration of bumper-to-bumper traffic, you’ll be free to text, Facebook with friends, or get a head start on your workday. Since you can cut your cost in half by riding with another passenger, seamlessly arranged by your mobility provider, traffic congestion will slowly fade away. Owning a car means car payments, insurance, registration, maintenance, gas prices, smog, tickets, accidents, finding parking, and dealing with the stress of traffic. Buying miles instead of metal means you’ll save thousands a year for your dream vacation, the kids’ college education, or buying a home of your own. In addition to lowering stress and regaining the use of 5% of your waking hours, putting an extra $5,000 a year in people’s pockets will compel this change. Driverless Car Revolution explains the benefits for people of all ages, from kids through seniors, plus the disabled, the working poor, tourists and other special groups. The book also discusses the economic disruption of major industries as well as potential geopolitical upheavals – all the pieces of the puzzle, and how they fit together. Fasten your seatbelt, engage, and prepare to join the Driverless Car Revolution.